At a small Catholic High School in Connecticut, everyone knows everyone elses business. One priest has mysteriously disappeared, while another has come to take his place. 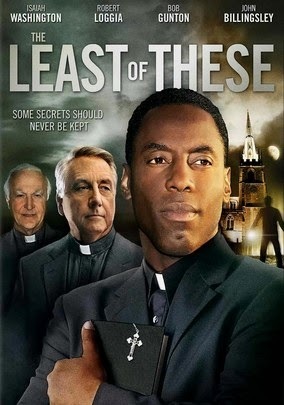 That priest is former student, Andre James (Isaiah Washington), who from the very beginning knows he isn't entirely welcome at his old school, which he comes to find holds many old secrets. I'm always a bit weary of films that are centered on religion, because if isn't done just right the film is ruined. If there isn't enough of a religious angle, the film isn't believable, but if there's too much, it feels like you're being converted. The Least of These manages to strike a perfect balance, as religion is a part of the story, but it doesn't dominate every aspect of the film. The true heart of this film is in it's mysteries, such as what happened to the old priest and what's this new guy all about? Isaiah Washington stars in what turns out to be the first serious role I've seen him play, and he is outstanding. Father James is battling his own demons and for all the good he wants to do, a part of him doesn't feel entirely comfortable in his new surroundings. Quite ingeniously, Washington is able to portray this not through words, but through his demeanor, which changes as the story progresses. Washington is paired with Jordan Garrett who is always very likeable no matter what type of character he is playing. It doesn't matter if he's playing an evil kid on Law & Order or the innocent victim in Death Sentence, Garrett somehow always manages to connect with the audience and get them pulling for his character. In this film, he plays an introverted outcast, who seems to be devastated by the disappearance of Father Collins. After connecting with Father James, the boy opens up and becomes yet another mystery of the old school. The Least of These was pretty entertaining and I suspect that a lot of the bad user reviews come from people who didn't make it through the whole film. I agree that it starts out slow and takes forever to get moving, but once it does, it really is a terrific story told by a stellar cast.